The original BMW X6 was launched in 2008 and met with mixed reactions. A first of its kind, the X6 has literally gone unchallenged till very recently when Mercedes-Benz launched the GLE Coupe. The new BMW X6 has been unveiled in India in 2015 and features new styling that goes in sync with the BMW styling language for all its cars. The new BMW X6 is a SAV or Sports Activity Vehicle and realistically only goes up against the Mercedes-Benz GLE Coupe and the upcoming Audi SUV coupe. On the exterior front, the X6 features bold styling and coupe like dimensions but on a high riding body. The front features the signature kidney grille setup with the headlights that extend into the grille. BMW X6 also gets LED headlamps and a new LED tail lamp setup. This car is mainly impressive due to its roofline that slopes down impressively giving it a coupe profile. The new X6 looks even sleeker and more impressive than ever before with its large new wheels and side gills that has made their way onto this car after making appearances on most other new BMW products. In India, the BMW X6 is only available in the M-Sport package that adds a lot of M-badged addons to the car including the sporty M-aero package. In terms of the interior, the BMW X6 is unmistakably BMW in its design and styling. With a prominent screen in the centre of the dashboard complimented by the wide centre console and controls for the media centre and the climate control. The transmission tunnel holds the gear shifter level which is also as familiar as every other BMW product recently and the control knob for the BMW iDrive system that controls the car’s system settings, media settings and other car settings in general. In terms of specifications, the BMW X6 comes with the 40d spec engine and permanent all wheel drive. The 40d X-Drive engine makes an impressive 317Ps of peak power and is helped by a new dual clutch 8-speed gearbox. The new BMW X6 also gets addons like Traction Control and launch control with electronic stability control. The BMW X6 is priced at Rs 1.15 crore (ex-showroom, Delhi) and will go up against the Mercedes-Benz GLE Coupe and the new Audi SUV coupe which will be launched soon. Expect the new X6 to be exclusive considering its pricepoint and placement. The first generation BMW X6 was also very popular with a host of celebrities and we expect the trend to continue. BMW X6 prices start at Rs. 92.20 lakh (Ex-Showroom). 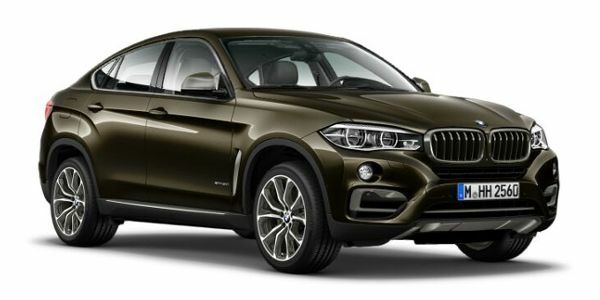 BMW X6 is available in 1 variants and 2 colours. Share your experiences with X6? The claimed ARAI mileage for the BMW X6 petrol is 10 kmpl. Q. Is this Suv available in diesel variant? No, BMW X6 is available with only one variant which gets a petrol fuel type engine mated to a automatic transmission i.e. X6 xDrive 35i M Sport. The BMW X6 is a 'Sports Activity Coupe' that combines the attributes of an SUV - high ground clearance, all-wheel drive and all-weather ability, with a coupe - bold styling, exhilarating performance and sloping roofline. The X6 sports a refreshed styling with a higher waistline and larger 21-inch wheels that offer better ground clearance. Front fog lamps sit higher up to improveThe bold and muscular BMW X6 comes with a hefty price tag of Rs 94.15 lakh - 1.30 crore (ex-showroom, Delhi). Upfront, the X6 has signature BMW kidney grill, double-barrelled headlights, aggressive bumper while in profile, the design features coupe-ish roof. Inside the cabin, the BMW X6 features Bang & Olufsen high-end surround sound system, contactless opening and closing of the boot, rear seat entertainment system, multifunctional instrument display, comfort access, 580-litre of boot space which can be enhanced to 1525-litre with all the rows folded down, and 40:20:40 split for the rear seat. Under the Hood, there is option of 3.0-liter V6 petrol and a diesel engine to choose from which put out 302bhp/400Nm and 313bhp/630Nm respectively, both coupled with 8- speed automatic transmission featuring the all-wheel- drive system. The BMW X6 has got the likes of Audi Q7, Mercedes Benz GLS, and Range Rover sport in its crosshairs. driver visibility. On the inside, the X6 boasts fit and finish par excellence. Powering the X6 are two engine options – a 4.4-litre petrol motor and a 3-litre diesel – with the xDrive system standard in both versions. Mercedes-Benz India will be launching 12 new models in 2016, starting with the new Mercedes GLE 450 AMG Coupe. At this price point, the Mercedes will compete with the likes of BMW X6. BMW will launch the X5M and the X6M in India in October 2015 and will aim to go up against the likes of the Mercedes-Benz ML63 and GL63 AMG.